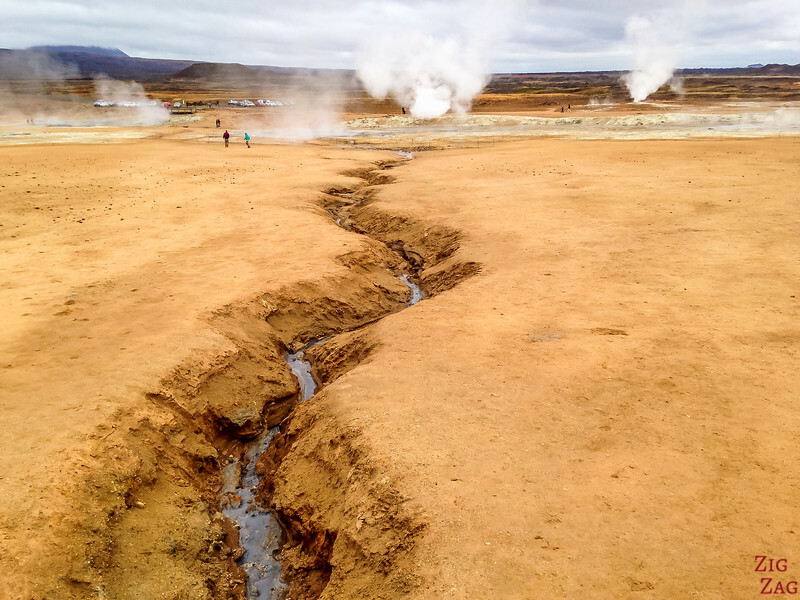 Hverir Iceland is one of the most out-of-this-world sites on the island. It is a place where you feel connected to the power of the planet. 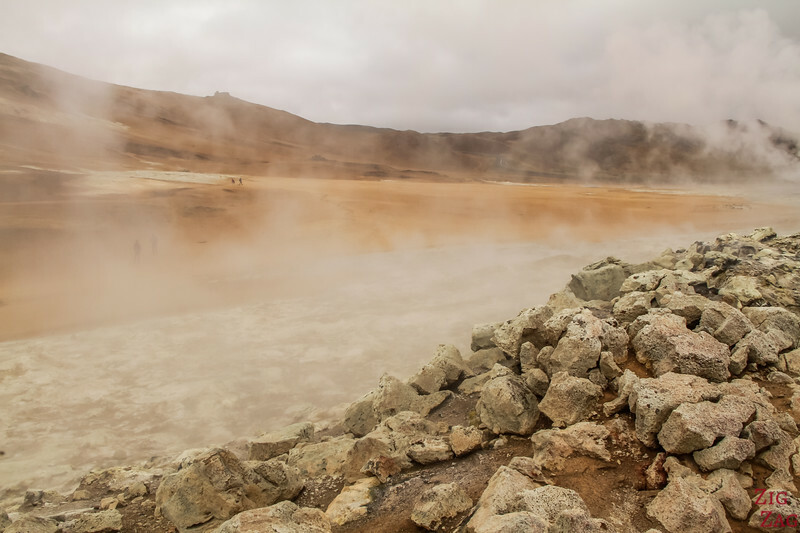 At the foot of the Namafjall volcanic mountain, the Namaskard geothermal area displays fumaroles, large mud pools, steam vents and a bare orangy-red landscapes. A unique sight! (and one of my personal favorites). Below is my guide to help you plan your visit. What is Hverir a.k.a. Namafjall a.k.a Namaskard ? 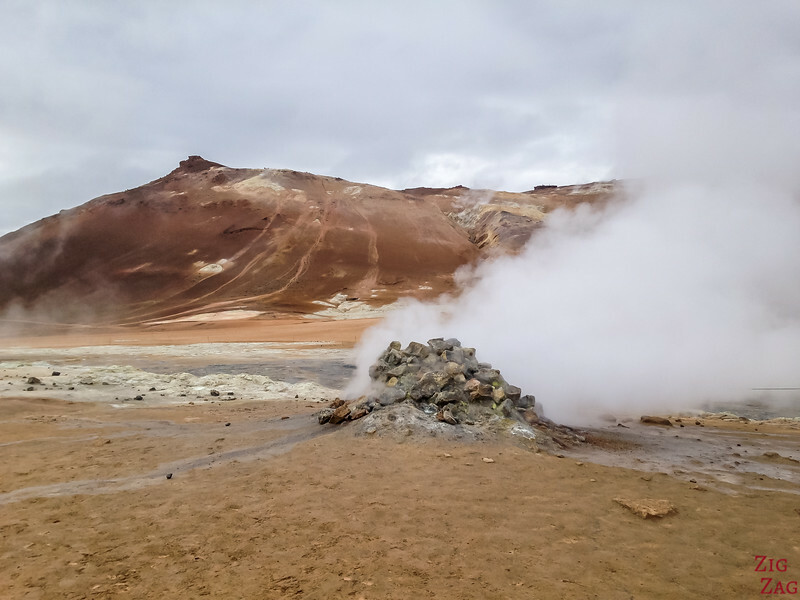 Hverir is a geothermal area with at the foothill of Namafjall, not far from Lake Myvatn. 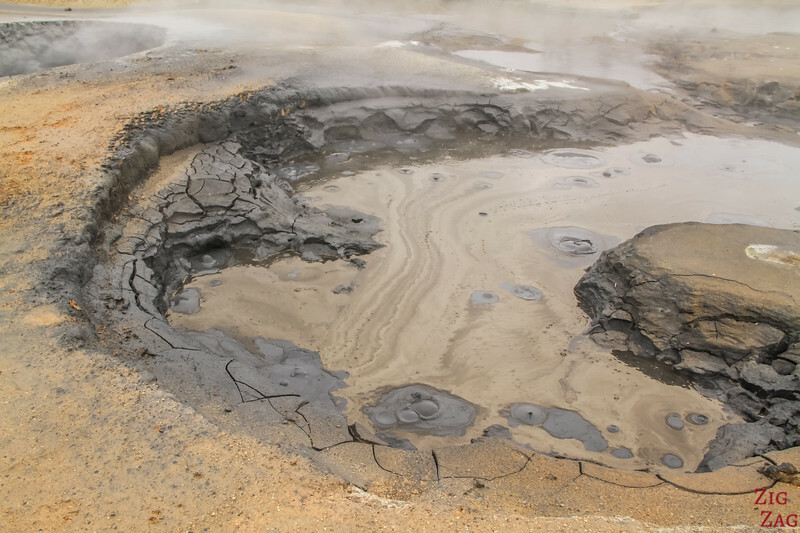 Features include colorful sulphurous mud springs, steam vents, cracked mud and fumaroles. 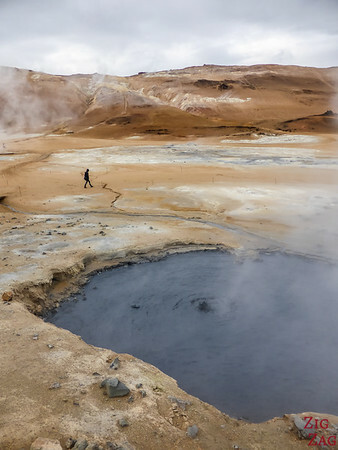 It is also called Hverarönd or Namaskard. Some say that compared to Wai-o-tapu in New Zealand or Yellowstone it is rather average but personally, I disagree. I have not seen Yellowstone but I have visited Wai-o-tapu. It does have as many geothermal features with intriguing colors but the surroundings are a lush forest. 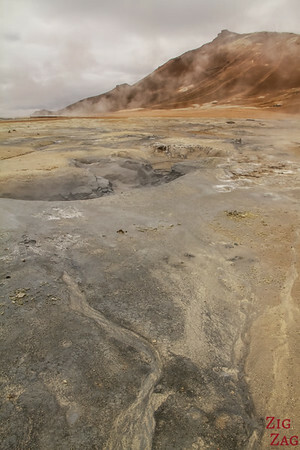 Although there is more to see, I think Hverir and its bare landscape makes the experience surreal which is what I love. If it weren’t for the other tourists, I would have felt like I landed on another planet. This is why it is one of my top 5 places to visit in Myvatn and one of my favorite stops on the Ring Road. 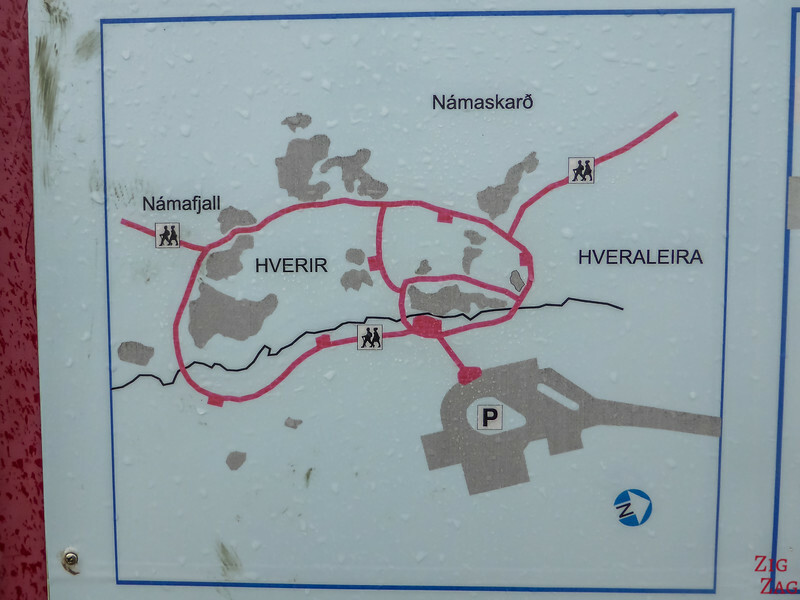 At the Hverir site, there is this map with indicated with areas with high temperature. 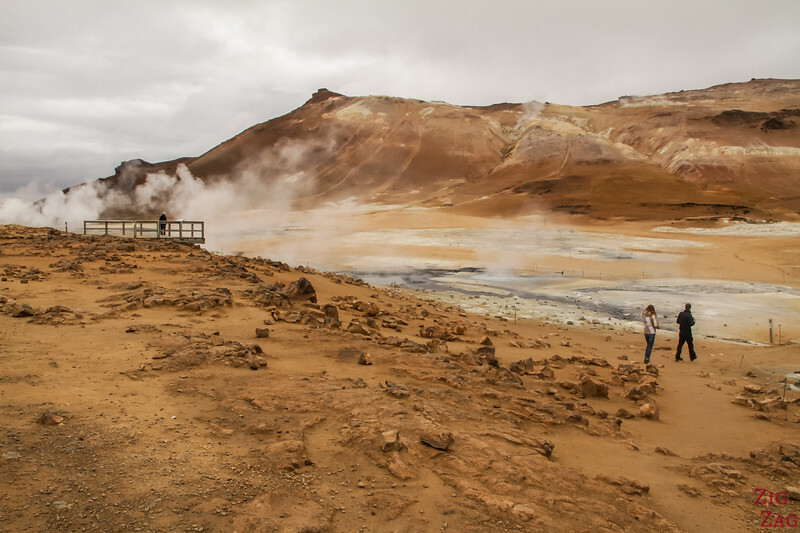 In light pink is the Krafla fissure system and in hot pink are the hot springs, including Hverir. Many more photos after the practical info and planning tips. 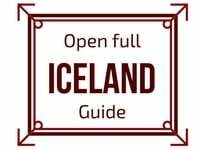 To facilitate the reading of this article, you can listen to the pronunciation of Hverir here. 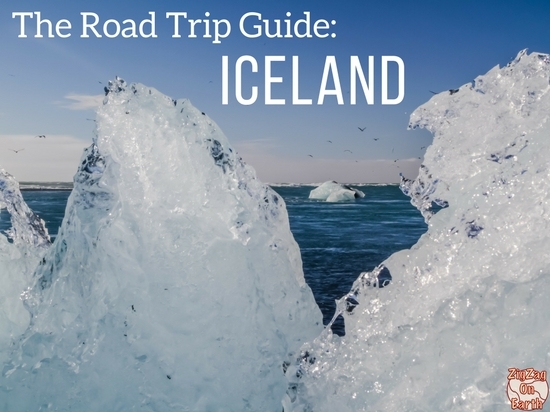 If you are visiting North Iceland and the Myvatn area, I strongly recommend renting your own car. This gives you the freedom to visit all the locations you are interested in. I personally rented my car with Route 1 car rental and really appreciated the experience. 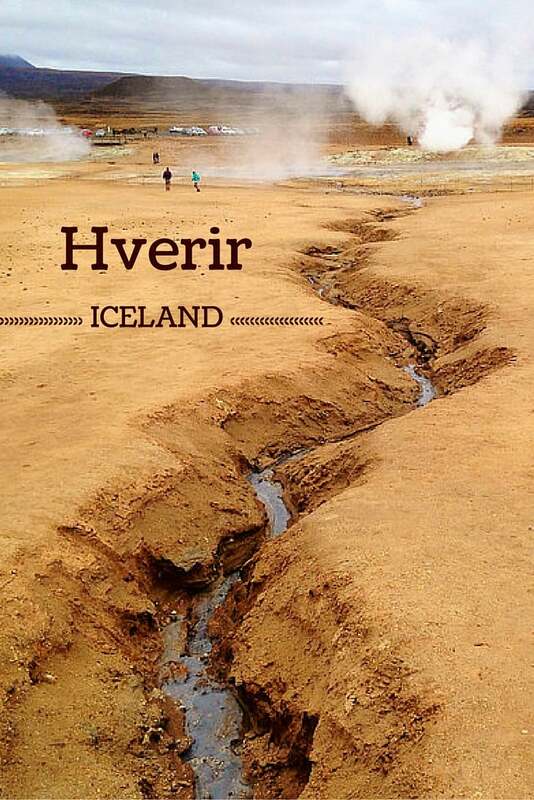 How much time to visit Hverir? 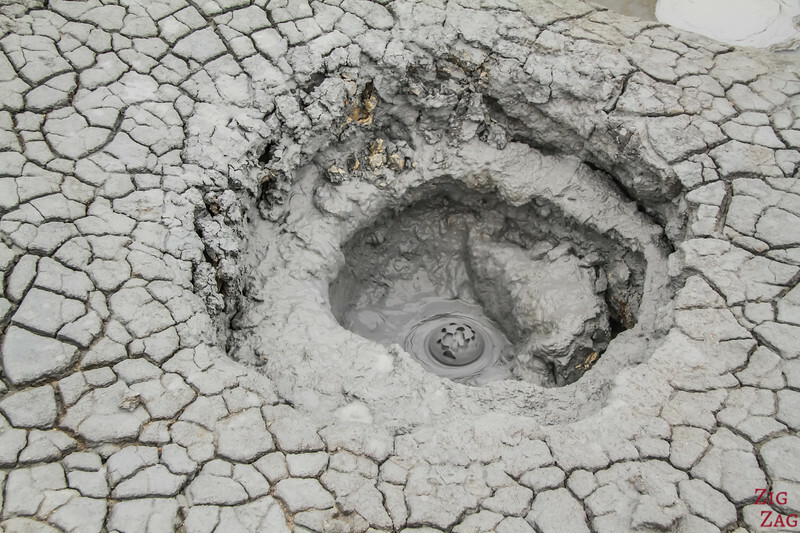 - The ground loop can be done in just half an hour or you can spend time admiring the bubbles in the mud pool and stay for an hour. Attention to the sulphur smell – it is not recommended to stay too long!!! 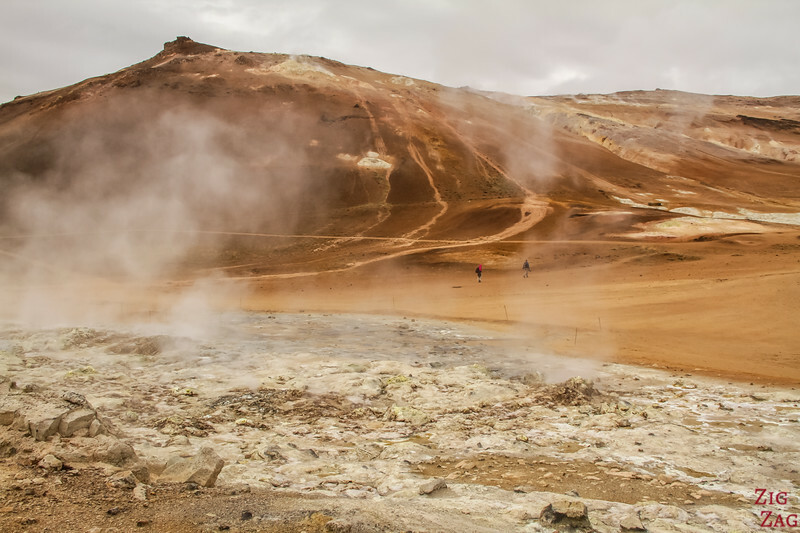 Note that although I suffer from allergies and all, I had no special difficulties while visiting Hverir. 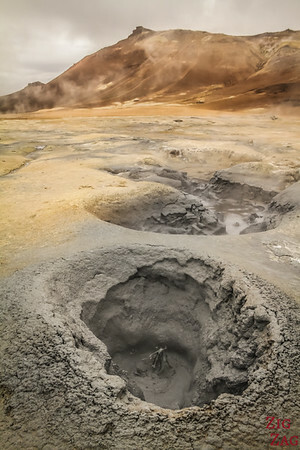 Hverir is not a big site but offers many features very close from one another. It is a the foot of a beautiful dark mountain. 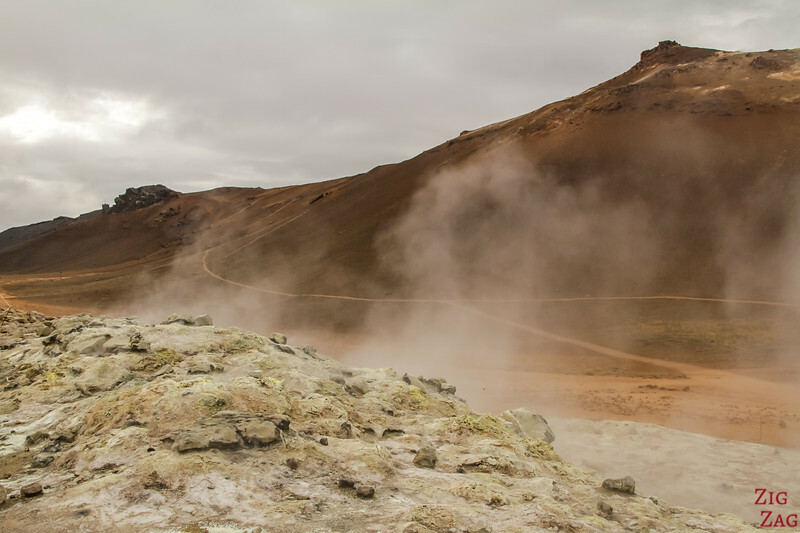 Below are some wide shots of the scenic area, its bare landscape and the fumes emanating from the fumeroles. I think the shot below is my favorite (equal with the cracks above). 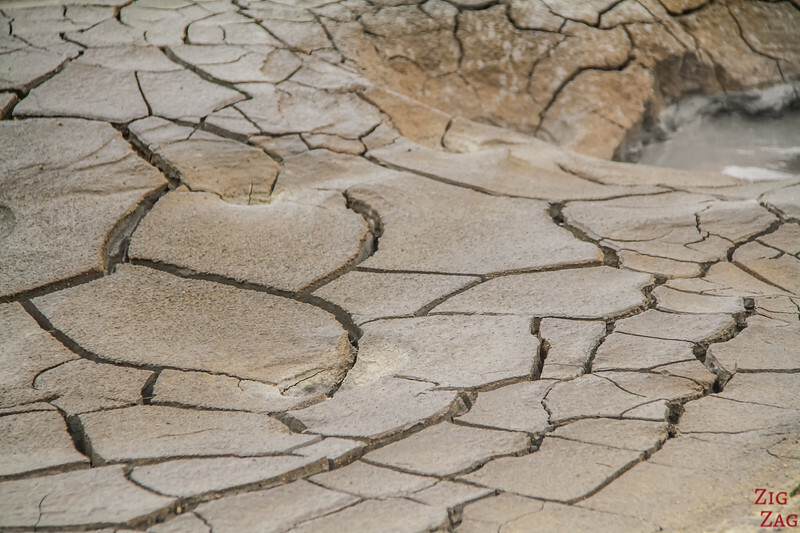 I love the contrast of the blue-gray mud pools with the dark orange of the moutain in the background. Surreal! 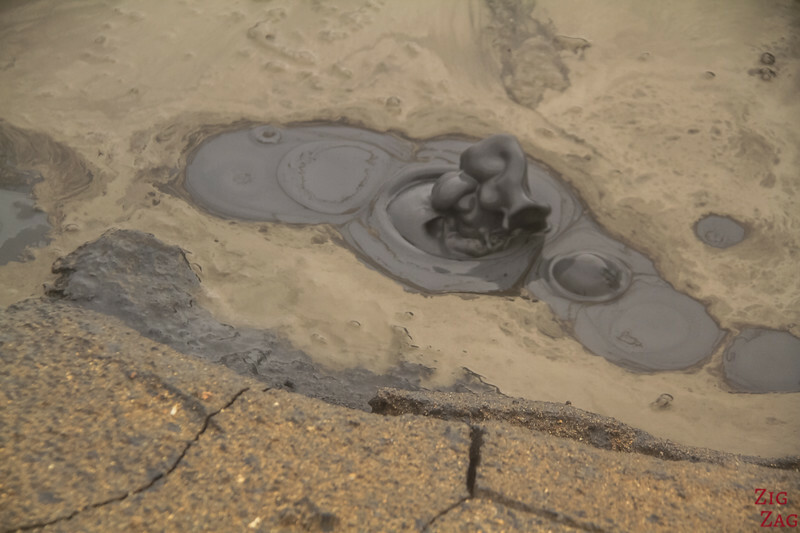 By the parking you can walk to the viewing platform or down to the mud pools. They are quite big and very active. You must have realised it by now, I love photographing cracked surfaces... So here is a last one! Past the mud pools there is a track that ascends up the mountain (see photo below), the goes along the ridge of the mountain and down on the other side of the area. The left side is the steepest with some slippery section. So it could be better to ascend on the right side and come back that way too. Surreal landscape, don’t you think? Love Iceland so much, these are great photos! I am reading through many of your posts at the moment as I am planning a trip around September 2016 with my little one and other half. What kind of lens did you use for these pictures if you don’t mind me asking? And also, we are planning to stay near Lake Myvatn for atleast 2 nights. Is there anything you would highly recommend in the area? 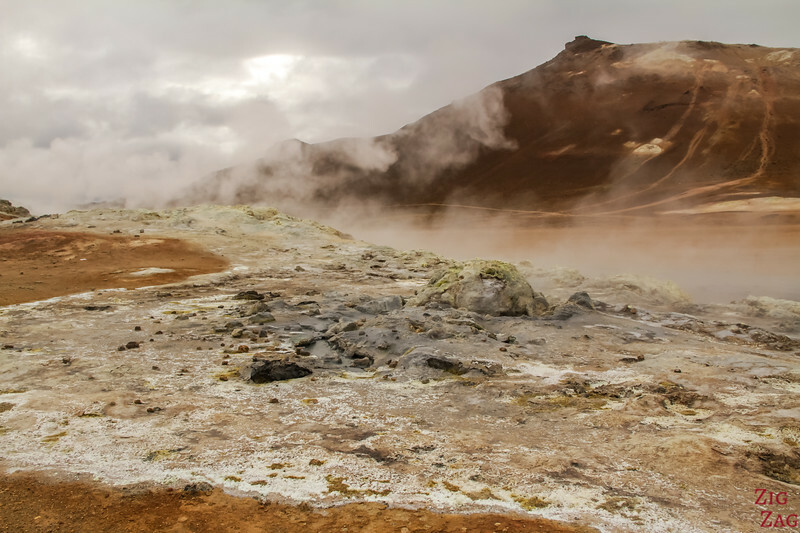 We are keen to do the natural bath in the area, and Krafla crater is also on the list. 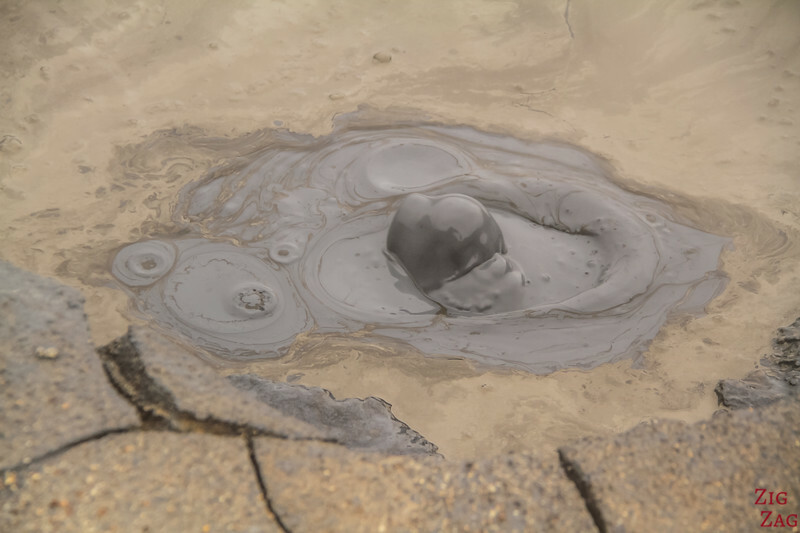 I want to see some areas with geothermal activity. I was using my usual Canon 7D with a Canon EFS 18-200mm lens. The Myvatn lake area was my favorite around Iceland. 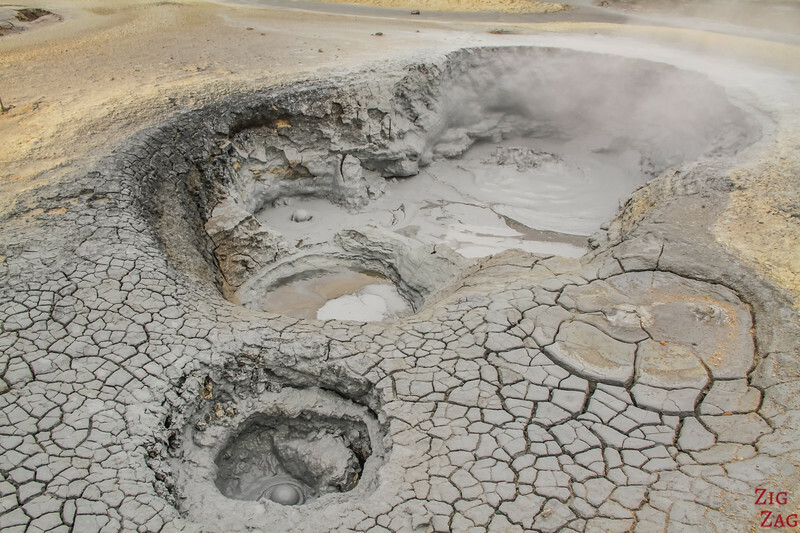 I think the Hverir geothermal area, the pseudocraters, the Dimmuborgir crazy lava shapes and the still fuming Leirhnjukur lava field were the best. Truly feeling on another planet!